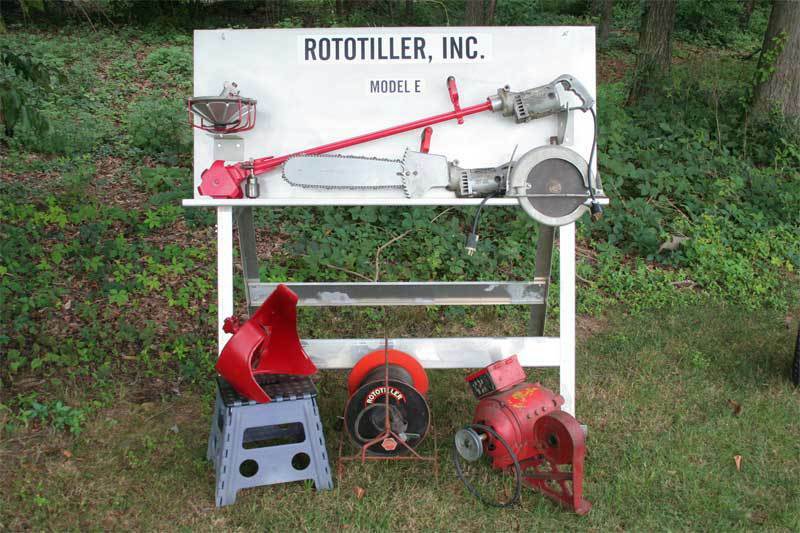 The Model E electric rototiller is powered by a 3/4hp electric motor that looks just like a drill motor. The motor was designed and manufactured by the General Electric Company. 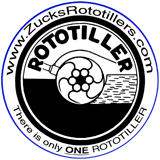 It has been called a little Rototiller at the end of a stick. It is not as light-weight as today’s string trimmers and modern hand-held tilling machines. This tiller was developed by August 1953 and has many accessories. It Sands!...It Stirs!...It Shines!...It Cuts!...It Drills!...It Grinds! Shown in the photo above are a 16" chain saw, rototiller, 1/2" Jacobs drill chuck, snow shovel, circular saw, trimmer-mower, 150' cord reel, and the 1500 watt generator for remote power. Also available were a 6" grinding wheel, lawn edger, sander-polisher, reel mower, and The standard length drive tube assembly was 33” long while a shorter one at 14” was also offered. Most of the attachments were quickly changed by the two latch type fasteners at the bottom of the drive tube. 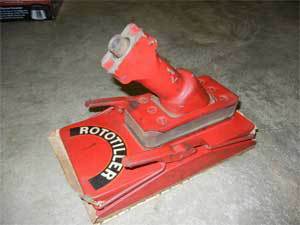 The two photos above are of the Model E sander-polisher attachment. Thanks to Allen Cluett for these photos of his sander polisher. 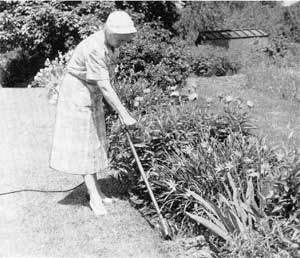 The development of this tiller was prompted by a Professor Stone telling Mr. Kelsey “….one of these days you must develop a little Rototiller at the end of a stick, something you can just poke around plants with”. Also, Mr. Kelsey’s wife ask him to make her a little Rototiller that she could use in her flower beds, “….something small and light like a vacuum cleaner”. She was featured in ads for this little tilling machine. Go to my YouTube Channel to see the snow shovel in action. For more photos go to my Photo Album. Reference materials for this page are from booklets published by Rototiller, Inc. and materials provided by Donald A. Jones, author of The Rototiller in America.